In the middle of the 19th century many people in Europe suffered hardship due to famine and economic decline. This hit the Franconian Forest particularly hard. That is why a committee specially convened by the Bavarian government decided upon measures to create employment in this region. Hand embroidery – also called whitework – was proposed as a means to improve people’s lot. It was above all women and girls who seized this chance of contributing a little to the family`s meagre income with this badly paid cottage industry. 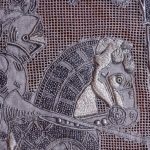 “Plauen sewing” – so called because the first commissions came from firms from the town of Plauen – gradually developed into what was called “Handstickerei Frankenwälder Art”, Frankenwald-style embroidery. The main products were bed and table linen, lingerie and bridal trousseaus. The impressive exhibits in the museum’s lace section illustrate the high artistic quality and the various stitching techniques used. 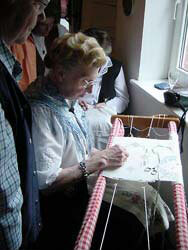 This method of lace-making and embroidery is a skill which very few women in the Franconian Forest still command. The “Nailaer Tafeltuch” – Naila tablecloth – is one of the treasures of the museum. This hand-embroidered tablecloth of about eight square metres is unique in the world. It was intended to be a present for the Bavarian Crown Prince Rupprecht, who planned to visit Naila. Oscar Frohmuth, a local textile manufacturer, was awarded the contract to produce it in his firm. 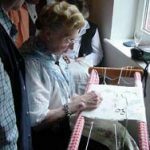 It took a group of women from the nearby village of Lippertsgrün many months to create this valuable work of art from one piece of fine densely woven linen. 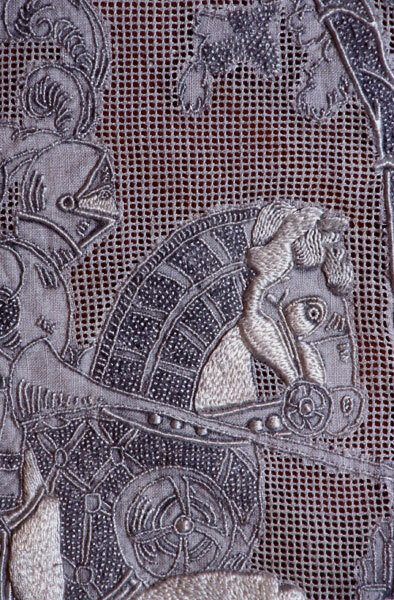 The tablecloth is decorated with twelve large medallions showing European palaces and twelve smaller medallions showing equestrian figures. Satin and damask stitch floral tendrils and scattered flowers as well as embroidered borders combine these elements to create one homogeneous piece. 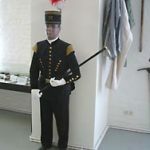 However the First World War prevented the Prince’s visit and it was many years before the tablecloth changed owners, being bought by a businessman from Cossen near Zwickau. In 1987 his descendants offered to sell it to the town of Naila. In this way it was possible to bring back home an outstanding example of local high quality handicraft. 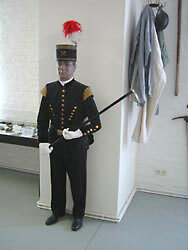 Since then the “Nailaer Tafeltuch” has been the centrepiece of the museum. 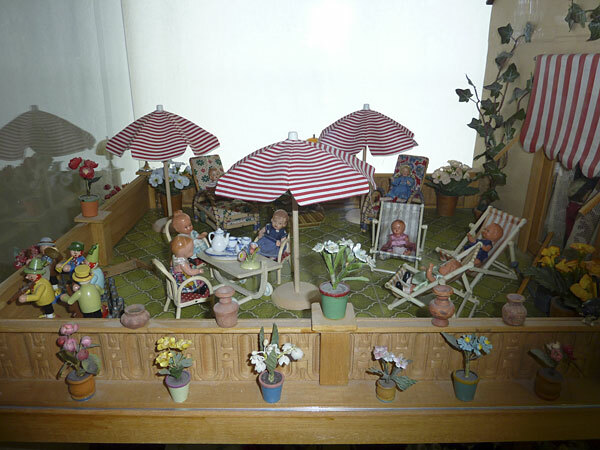 One of the museum’s special exhibits was the result of one father’s love for his daughters: a doll’s house with over four square metres of “living space”. Over a number of years this toy villa was painstakingly crafted, showing the beholder the world of a wealthy bourgeois family in former times. 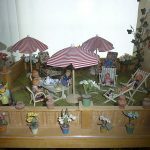 More than 40 little dolls bring the 20 rooms of the house to life. The baby in its cot, father taking a nap, the children in the bathroom or grandma in her cosy living-room all tell little stories of daily life. From the attic with its clothes line and storage areas and the living quarters with sun terrace to the basement with a small grocer’s shop, garage and carriage house, the industrious and at the same time leisurely life in a grand villa is presented. The town of Naila can look back upon a long history. On 9th January 1343 Heinrich the Elder and Heinrich the Younger, the landvogts of Weida, granted Hans von Weisselsdorf and Konrad Radecker “das gericht vber das dorf zu Neulins“ (“jurisdiction over the village of Neulins“). This is the first documented mention of Naila. Margrave Johan IV of Kulmbach-Bayreuth and Brandenburg granted the market town Naila a coat of arms on 21st December 1454. On the right it was quartered in black and silver – the arms of the House of Hohenzollern – while the left half had a savage man (“Wilder Mann”) wearing a wreath and loincloth of leaves, holding a golden club and standing on green ground between two green trees against a red background. Thanks to the booming mining operations, Naila, with its mines and ironworks, was then an important centre in the Franconian Forest. Granted town status in 1818, Naila was almost completely destroyed by a devastating fire on 3rd August 1862. That is why today’s townscape boasts very few historical remains. The local history section shows exhibits from various epochs. Mining for ores probably took place in Naila as early as 1000 years ago. In the 15th and 16th centuries this industry experienced its heyday with miners digging above all for iron and copper ore. The names of the mines – “Rich King Salomon”, “Queen of the Arabian Empire” or “Wild Man” – still today bear witness to their high yields. In 1683 the Mining Office for the Selbitz valley region was established here, Naila being the centre of this flourishing industry. Mining in Naila experienced its second – and at the same time last – peak around 1740. According to records the mine “Oberer wilder Mann” (Upper Wild Man) yielded ca. 50 cubic metres of ore per week, providing employment for about 400 miners. The middle of the 19th century saw the vain attempt to revive the mining industry and maintain it against foreign competition, however this economic sector in Naila collapsed once and for all in 1858. Exhibits from 800 years of mining bring back memories of this trade. Shoemaking was one of the main, traditional industries in Naila. Long before the Thirty Years’ War, cobblers in Naila were using the leather produced by the local tawers and tanners. 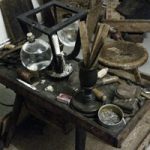 In 1632 they founded their own cobblers’ guild, which was given a charter by Margrave Christian in 1646. Naila cobblers mainly made sturdy working shoes and boots of high quality, in particular for miners, farmers and forestry workers. The surrounding towns and villages were their main sales outlet, but they also sold their goods as far away as at the Sunday markets in Kronach or in Thuringia and Saxony. The cobblers’ trade was gradually replaced in the 20th century by the industrial production of shoes, with three large shoe factories – Seifert & Klöber, Tamm and Frankonia – being opened in Naila between 1885 and 1920. 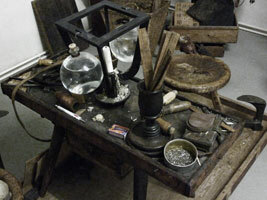 Our cobbler’s room gives an insight into the good old days when shoes were made by hand. Due to a sensational incident in September 1979, Naila became the focus of international attention for a short while. Two families with children succeeded in fleeing spectacularly from the former communist East Germany. 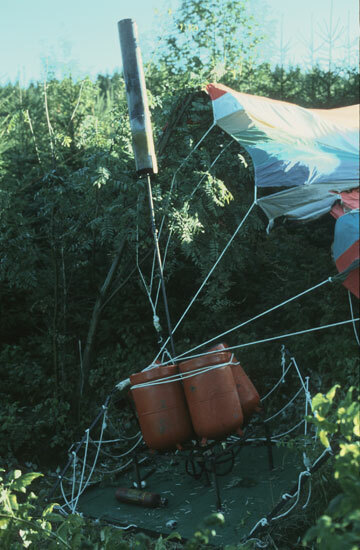 With their home-made hot-air balloon they managed to get over the inner German border. Their 20-kilometre-long flight, 12 kilometres of which crossed East German territory, ended in a happy landing at Finkenflug on the outskirts of Naila. 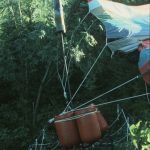 Eight people had huddled closely together on the tiny platform under their balloon, which had reached a height of 2000 metres. In gratitude for the help and the hearty welcome they received in the West after their landing, the daring refugees presented the balloon to the town of Naila.